When it comes to handling the controversy over her past claims to Native American identity, Elizabeth Warren can’t seem to win. When it comes to handling the controversy over her past claims to Native American identity, Elizabeth Warren can’t seem to win. Someone, somewhere is going to keep attacking the Massachusetts senator no matter her response. This week’s latest development: A Washington Post story about Warren having listed herself — in her own handwriting — as an “American Indian” on a registration card with the Texas bar in 1986. Warren grew up believing she was part Cherokee. But answering the question the way she did was a mistake, even by the standards of 1986. Warren’s never been a member of any tribe. She’s white. Playing loose with the facts about identity is bad within the current political climate of the Democratic Party, where issues of race have come to the fore. 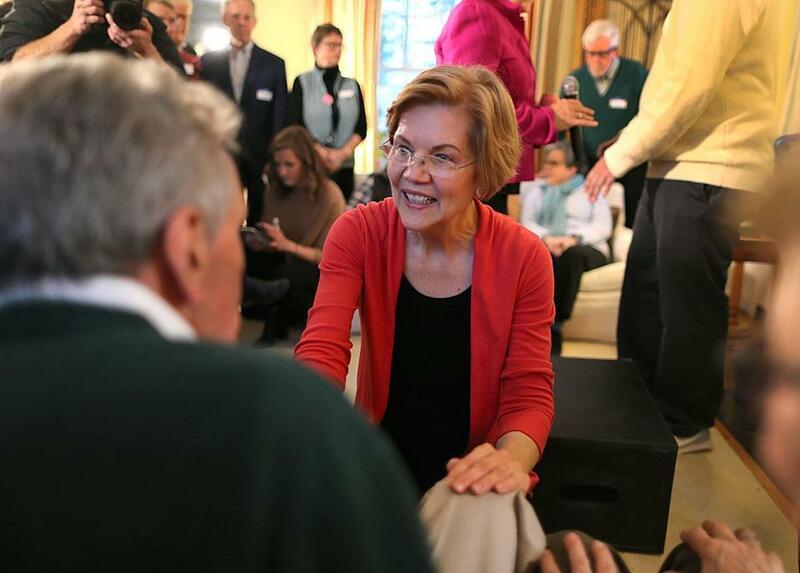 If Warren can’t stop the slow bleed of bad news now, the presidential candidacy she is expected to launch in Lawrence on Saturday is going to go nowhere fast. To unseat Donald Trump, Democrats need to put up the strongest candidate possible, not another wounded one. A polarizing figure, Warren already faces headwinds that complicate her candidacy. The best thing Warren can do — what she needs to do — is put all the facts about her past in front of voters. The senator needs to search not only her records but her conscience to end the drip-drip-drip of fresh revelations. Only Warren knows how much worse her political travails can get. For the sake of her campaign — and of her party, should she end up winning the nomination— any further revelations must come from her. Voters ready to forgive and move on might feel differently if the slow drip continues, or if her explanations don’t hold up. She should have put all this to rest years ago when it first came up in her 2012 Senate campaign against Scott Brown. This go-around, Warren needs to deal with the issue now, rather than in October 2020. And oh, there’s one more thing and it’s unbelievable Warren hasn’t done it yet: Deliver an honest apology publicly. Warren put herself in this predicament. She has said that listing herself as an American Indian was made with no ill intent, not understanding how insensitive it was. She did it, she says, to honor relatives who’d passed down stories of their native ancestors. Critics long ago settled on the conclusion that she listed herself that way as a cynical ploy to exploit affirmative action policies at universities. There, it’s important to note that an extensive Globe investigation last year found no evidence that Warren listing herself as a Native American helped her legal career or her hiring at Harvard Law School or any other law school where she taught. The information on the Texas bar registration card was collected for statistical purposes, and there’s no indication it was shared with anyone. If it was all a scheme to further her career, then Warren’s not very good at scheming. Still, much of the political damage is already done, and Warren’s never going to silence critics like President Trump, who gleefully taunts her in racist language. Warren took and released a DNA test last fall confirming she has some ancestry dating six to 10 generations ago, but that did little to defuse Trump. And among white voters who resent affirmative action, the issue is probably going to be a lasting political liability. But many Americans are still making up their minds about Warren. And she shouldn’t presume that the scrutiny of her past is going to end as she formally launches her presidential campaign. If there are other times she listed herself as a Native American, she should disclose them before reporters find them. If there’s a paper trail around any of her claims to ethnic heritage, she should expect that it will come out in the campaign. And if there’s any evidence that rebuts her explanation for why she listed herself as “American Indian,” she should expect that to come out too. It’s up to the senator to assure voters that there are no more shoes to drop. Letters: In Elizabeth Warren’s case, has decision already been made for her?